DIY Home Fixes: 6 Tools The Pros Use That Every DIY-er Needs Help the Kids in Your Community Today! We love getting new books in the house. Cooper is now able to read some on his own which is so exciting to see. He has ADHD so his reading is a bit behind so it’s nice to keep working with him on it over summer with new books that he doesn’t have memorized. I was so thrilled to review this book from the BMI doctors of Texas. 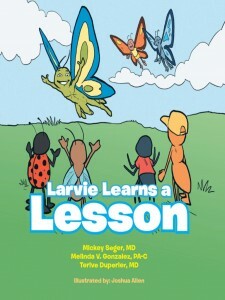 Larvie Learns a Lesson tells the story of a caterpillar that finds himself in a dilemma as a result of unhealthy eating habits and a sedentary lifestyle. With the help of his doctor, he reshapes his life, changes his eating habits and cures his high blood pressure [pillar-pressure] and diabetes [pillar-pressure]. This then enables him to transform into a strong and healthy butterfly, he was always meant to be. I love books that have great meanings. This is all about health eating and creating good habits. Something I know we need to personally do better at. We try to make healthy meals at home and what I love about this book is it shows what happens when you eat too much and become lazy. Although I should take notes from this book as well! I think as a child hearing a doctor say, even if it’s in a book, that they must exercise more and not watch so much TV or play video games, is a healthy way to live. The results in the book are proof of what can happen when you take care of yourself. You become a beautiful butterfly. I think this is such an important lesson to learn and the sooner the better. I can tell you I certainly didn’t hear these things when I was growing up. Make sure to add this to your must read summer book list!